Use whatever game you can get for this tasty recipe. It requires a little work, but the results are well worth the effort. In a large mixing bowl combine the sausage meat and the chopped livers from the game. For the best possible texture and easy slicing, your terrine should be pressed as it cools. Find a piece of wood or plastic that fits snugly inside the terrine dish and weigh it down with a brick or two. (Another similar size dish or loaf tin with a brick inside often does the trick, but wrap it in cling film if you're using a tin.) 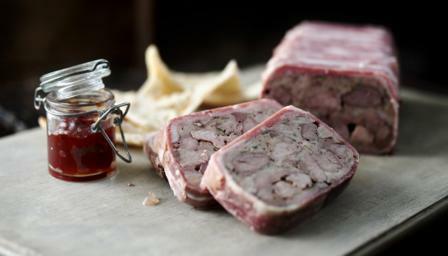 Leave the terrine until completely cold for several hours or overnight. To serve the terrine, slice it thickly with a very sharp knife, put on a plate with a small salad of lightly dressed green leaves and a blob of good fruit chutney. Serve with hot toast.